This line is closed. It probably should not have been closed as to get to St Andrews from the railway now involves a taxi or bus journey from the relatively nearby station of Leuchars. As many passengers approach from the south this were the line to be rebuilt trains would have to make a "reversal" at Leuchars, Milton Junction. Guardbridge viaduct from the south. From St Andrews to Leuchars. This was a north facing junction with the Edinburgh and Northern Railway. Guard Bridge viaduct from the south. This was a single platform station with sidings serving a paper mill. 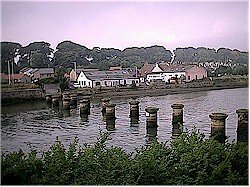 On it's way to St Andrews the line crossed a river - the piers of the old bridge are still visible but the girders removed. Nothing remains of the station today. The original station at St Andrews has been incorporated into a hotel. Once the line was extended south by the Anstruther and St Andrews Railway a new station was opened in the town and the old station became a goods yard. Note - the portion of the line between the two stations was not built by the A&StAR, this was built by the North British Railway who by this stage were the owners of the former St Andrews Railway and thus extended it, clearly wanting to have a interest in the new station, which was jointly owned.